Add a pop of red to your life with this stylish bread box. Our eco-friendly bread bin is great for any kitchen, but can also be used for picnics or any other fun occasion. Time to add a pop of RED to your life! . This gorgeous bread box will add style to your kitchen. Whatever style you are trying to achieve, it will work seamlessly in any modern, farmhouse, contemporary or vintage setting. Aside from it’s good looks, this bread bin holds your bread, bagels, snack bars and more in an organized manner to keep your kitchen clutter free. As many of our other products, this bread box is made out of bamboo fiber which is eco friendly, durable and light weight. The material feels like a very hard plastic or melamine, but is completely environmentally friendly. 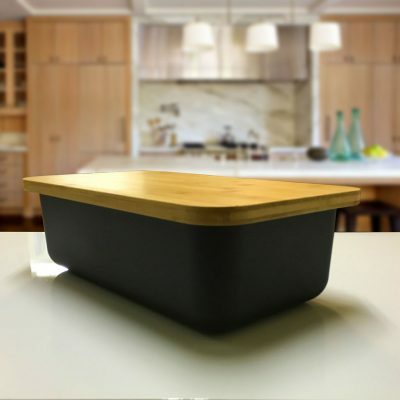 In addition to an attractive base, this breadbin features a bamboo lid that doubles as a cutting board with grooved crumb catchers to keep your countertops clean as you cut. Elegant to use in your kitchen, or use as a unique container to take out on a picnic. This high quality and unique bread bin also makes the perfect gift. ADD TO YOUR CART NOW to enjoy. The Clean Dezign bread box pairs perfectly with our other red items including our large salad bowl and kitchen canisters.